BMW invests 250 million in UK factories | What Car? 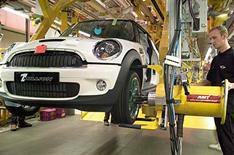 BMW is to invest a further 250 million in its UK factories, as it expands production of the Mini. With up to 10 new models planned for the Mini range, BMW will invest the money to help boost production capacity at its sites in Birmingham, Oxford and Swindon. The announcement was made during a visit to the Oxford factory by business secretary Vince Cable. He said: 'BMW's ambitious plans for Mini will ensure its UK sites at Oxford, Swindon and Birmingham remain at the centre of Mini production worldwide. However, BMW also revealed that it was considering setting up 'satellite production' of the Mini at sites outside the UK. The company is in discussions with Nedcar a part of Mitsubishi to look at the possibility of using its Born factory in the Netherlands. Nedcar will have spare capacity following Mitsubishi's decision to cease production of the Colt supermini from next year.